A few notes about Constitution's guns based on some recent scholarship that may be helpful with your models. There are differing opinions regarding what Constitution actually carried for weapons. Some assert that by the War of 1812, all of Constitution's guns were of American manufacture. Others argue that they remained a mix of manufacture, British and American. Here is a short summary of some of these opinions and what is presently known. It is generally agreed that Constitution's array of weapons changed frequently, sometimes even during a deployment. When first built, it is believed that Constitution carried American-made Furnace Hope 1794-pattern 24-pounder guns that were 8 feet long (relatively short for 24-pounders) on her gun deck. The Furnace Hope Iron Works was located in Rhode Island. On her spar deck, Constitution at first carried a mix of 18-pounders and 12-pounder long guns obtained from various sources. The 18-pounders may have been "fortification cannons", meant for army use, and sourced from Ft. Independence in Boston Harbor. It is believed that the 18-pounders were soon landed leaving only the 12-pounder long guns on her spar deck. Constitution likely first put to sea with only the short 24-pounders on her gun deck and 12-pounders on her spar deck. Recent scholarship indicates that the Furnace Hope short 24-pounders, having been found to be inaccurate and having insufficient range, were replaced in 1808 by 9'-6" long 24-pounders produced by the Cecil Iron Works in Maryland. If correct, this means that the 24-pounders Constitution carried on her gun deck during the War of 1812 were all 9'-6" American-made guns. Some historians assert that the new Cecil Iron Works 1808-pattern cannons were close copies of the very successful British Blomefield 1790-pattern 24-pounder cannons. The 12-pounder long guns on her spar deck were also found to be largely ineffective, less desirable than carronades, perhaps because carronades fired a heavier shot, required a smaller crew, and were lighter and smaller, distinct advantages on a spar deck. It is generally agreed that Captain John Rodgers took 8 carronades aboard in 1804 and mounted them 4 to a side at the waist, forward of the 12-pounders. They were found to be very capable and complimented the 24-pounders on the gun deck very well. These 8 carronades were probably made by Henry Foxall of the Columbia Iron Works at Georgetown, Maryland (now a Washington, DC suburb), but this is not certain. Constitution's carronades, if American-made by Columbia Iron Works, would have had a hemispherical cascabel (breech) rather than the stepped cascabel you see on the British-made carronade above. Hope this helps fire your imagination about the days of wooden ships and iron men. * "The History of the American Sailing Navy" by Howard I. Chappelle, pg. 132. [b]A few notes about [i]Constitution[/i]'s guns based on some recent scholarship that may be helpful with your models. [/b] There are differing opinions regarding what [i]Constitution[/i] actually carried for weapons. Some assert that by the War of 1812, all of [i]Constitution[/i]'s guns were of American manufacture. Others argue that they remained a mix of manufacture, British and American. Here is a short summary of some of these opinions and what is presently known. It is generally agreed that [i]Constitution[/i]'s array of weapons changed frequently, sometimes even during a deployment. When first built, it is believed that [i]Constitution[/i] carried American-made Furnace Hope 1794-pattern 24-pounder guns that were 8 feet long (relatively short for 24-pounders) on her gun deck. The Furnace Hope Iron Works was located in Rhode Island. On her spar deck, [i]Constitution[/i] at first carried a mix of 18-pounders and 12-pounder long guns obtained from various sources. The 18-pounders may have been "fortification cannons", meant for army use, and sourced from Ft. Independence in Boston Harbor. It is believed that the 18-pounders were soon landed leaving only the 12-pounder long guns on her spar deck. [i]Constitution[/i] likely first put to sea with only the short 24-pounders on her gun deck and 12-pounders on her spar deck. Recent scholarship indicates that the Furnace Hope short 24-pounders, having been found to be inaccurate and having insufficient range, were replaced in 1808 by 9'-6" long 24-pounders produced by the Cecil Iron Works in Maryland. If correct, this means that the 24-pounders [i]Constitution[/i] carried on her gun deck during the War of 1812 were all 9'-6" American-made guns. Some historians assert that the new Cecil Iron Works 1808-pattern cannons were close copies of the very successful British Blomefield 1790-pattern 24-pounder cannons. Built an armed launch from the 32' boat in this kit, using one of the carronades. Centerline stowage are two crates and two barrels shaved from the deck of a R.E. Lee steamboat. Note that this is built in two subassemblies - the hull & mast, then the 'deck' with gun. Hard originally thought to use an oar as a rudder. Instead of a simple lanteen rig, I'm going for a reverse rig. Her last major reconstruction fixed a lot of those issues. The installation of her diagonal riders also helped. They're in her original plans but its unknown if they were ever actually installed as built in 1797. Now, if they'd only restore her to her War of 1812 appearance like the law actually requires (black and buff paint scheme, new stern and quarter galleries, figurehead, etc. ), she'd be even more beautiful! I believe that is what her current period of restoration is attempting to acheive. [quote="aptivaboy"]Her last major reconstruction fixed a lot of those issues. The installation of her diagonal riders also helped. They're in her original plans but its unknown if they were ever actually installed as built in 1797. Now, if they'd only restore her to her War of 1812 appearance like the law actually requires (black and buff paint scheme, new stern and quarter galleries, figurehead, etc. ), she'd be even more beautiful! Awesome! Amazing how little the hull appears hogged in any of the photos. Here are some 500 photos of USS Constitution from the early 20th ctry. Since this thread has resurfaced, I thought I would post this photo as it's a new favorite of mine. do you still have the building plans of the USS United States in scale 1:150? I seem to have lost mine... and, if so, is there any way I can get them? Very nice build of Constitution using the classic Revell 1/96 kit, fully detailed and improved. Hopefully, we can persuade the modeler to post pics on this site as well. Very nice build of [i]Constitution[/i] using the classic Revell 1/96 kit, fully detailed and improved. The Facebook page is not coming up fro photos of the ship. Perhaps you should send pix to the gallery for all to see? Please accept my sincere apologies for this grievous error and the failure of the previous link. Post subject: What should be near the Fife Rail? - A Fifer of course! 0800 - While in my quarters preparing for my duties, I heard a most pleasant sound coming from the deck. It was the sound of fife music. But not a simple compositions usually heard during battle. The music I heard was a much more refined piece that I could not identify. I proceed quickly to the main deck. It was a beautiful morning. Warm with light breezes. Most of the crew were working quietly. But some stood facing the bow, pleasantly entranced. I followed the sound forward until I discovered our young fifer, Anastacia Buschmann, playing near the foremast fife rail. The piece she was playing was beautiful. Light, airy and very complex. This was no fifer! This was a musician of great talent! Several officers joined me and listened intently. The Captain arrived, too. He smiled, and I could tell that the music seemed to ease his mind, being so troubled of late. A weight seemed to lift from his shoulders as he listened. The crewmen were quiet as well, refraining from their usual loud banter. Perhaps, civilized by the moment. Many faces were seen poking through the deck hatches and there was a lot of clamoring to get a better view. I also happen to notice her father, Timothy Buschman (the Boatswain), listening from high above on the main mast fighting top. He had a very, proud look on his face. In this capacity, the ship’s “musicks,” as the fifers and drummers are typically referred to, are expected to call the crew to dinner… and to battle stations. Above the deafening roar and confusion of battle, the sounds of the fife and drum convey orders to the sailors. The unpredictable nature of life aboard a war ship means that she must be prepared to play at any moment’s notice. But in this moment she was at peace, happily playing this beautiful melody. No doubt seeking the challenge of a more difficult composition than what she is expected to play during battle. When she was finished, I spoke kindly to her about her talent. She was most humble and very gracious. I later told her father of my appreciation of her great talent. He humbly agreed, but he quickly laughed and said with a smile that “Great musical talent runs in the family!” He then began to sing very loudly as he quickly climbed up into the shrouds and ascended to the highest elevation of the mainmast, out onto the royal yard arms. His booming voice was heard for most of the morning and into the late afternoon, until he finally stopped to notify the officers on deck, that there were dark clouds on the far horizon and a heavy squall was most likely in our future. It has come to my attention that a few of the videos that I have created were posted as "private" on YouTube. A vexing dilema to me, for sure. However the problem has been resolved. My only hope is that you are not tired of them by this point. "Undefeated: The Story of Old Ironsides"
The first video I made. Designed to tease the completion of the model. "One by One - The Story of the USS Constitution"
A historical dramatization (overly dramatic perhaps) of the impact the USS Constitution had on the formidable British Navy. It Had to Be Built"
A video about the inspiration, and subsequent obsession, with the building of a model of the USS Constitution, and my plans to expand the experience online. A compilation using images of the completed ship taken by a professional photographer, which also portrays real people who have joined the crew through Isaac Hull's Facebook page. "The Life of a Super Model"
A documentation of the photo shoot itself… but with a fashion spin. My name is Isaac Hull. I am captain of the U.S.S. Constitution. "Old Ironsides" as many of you may already know it. When I assumed command of the Constitution in December of last year, I saw fit to rebuild this fine ship. A complete overhaul. Everything from the copper plates on the hull... to the upper reaches of the masts. No expense was spared. And nothing was overlooked. 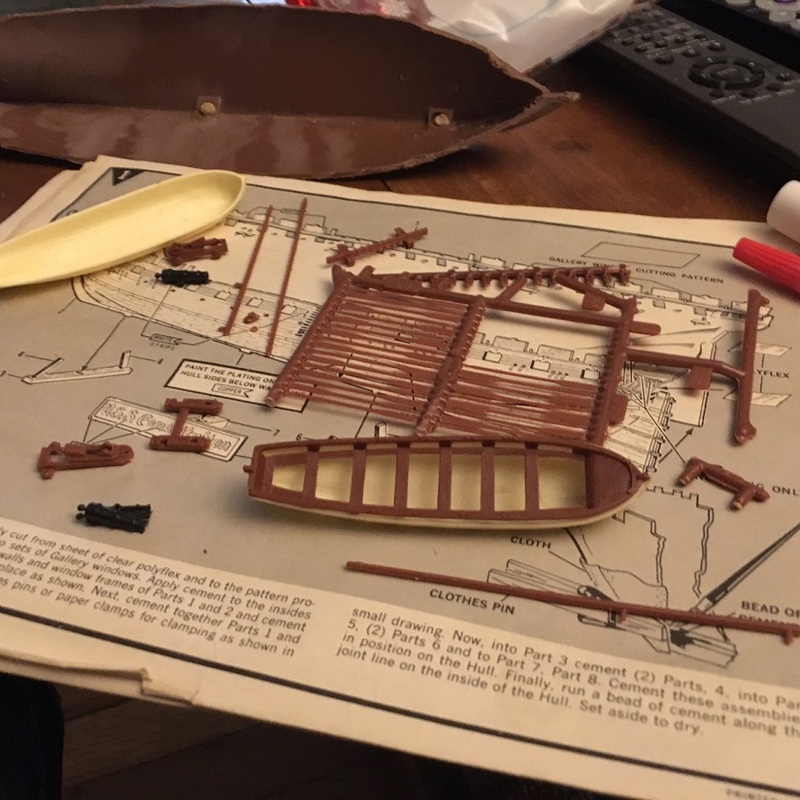 When complete... this fine, old ship will be ready for the high seas and, most certainly, victory in battle. She will have new yards, rigging, decking, long caliber carronades, masts, bowsprit, cutters, ratlines, etc. Even a new head on the bow. The work has been difficult. Tedious at time, but well worth it. But now... it is complete. 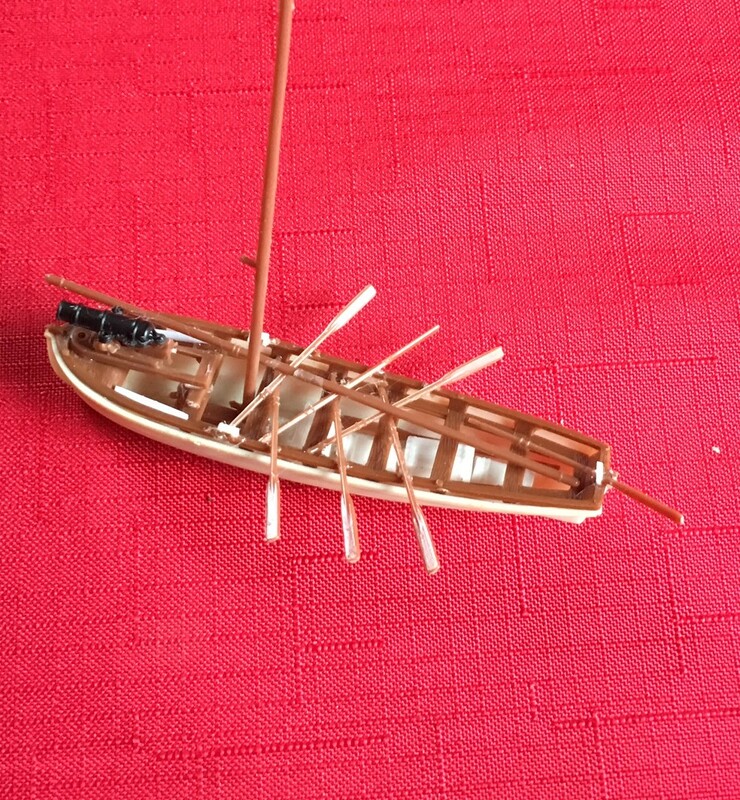 - Photos of the finished ship. - Links to several moving pictures I have created during the process. - A link to my Facebook page. On the Facebook page you will find entries taken from my correspondence with superior officers in the Admiralty. Which contain weekly reports of our progress. Evidence of each stage are presented visually as well, with dated collections that correspond to each entry. I felt compelled to share our progress to any interested parties. Hence, this page. 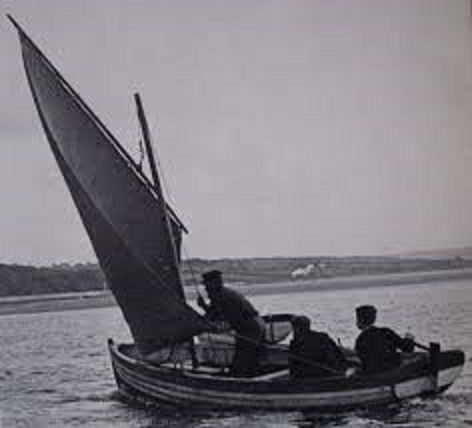 In addition to that, I will continue to add historical references relating to this ship and the Age of Sail. I also intend to post further correspondence in the form of a Captains Log. Where our travels (based on real history) and our crew exploits (based on my imagination and my supporters depicted as crew, portrayed in miniature on this ship) will be posted on a regular basis. Please be reminded that this Facebook page is not a sponsored promotional tool or a means to advertise anything. It's just me… and my love of the Age of Sail. I look forward to future correspondence, and am open to suggestions of matters relating to our fine ship, as you see fit. Fare thee well, and God bless America. Photos of the completed ship can be found here. Being my first assembly, the work has been difficult. Tedious at time, but well worth it. But now... it is complete. And I am quite proud of it. It is most capital! Evidence of each stage are presented visually as well, with dated collections that correspond to each entry. I felt compelled to share our progress to any interested parties. Hence, the page. How about this? Check it out on the Flagship Models web site http://www.flagshipmodels.com/zencart/index.php?main_page=product_info&cPath=7&products_id=115. Lots of optional figures also available sculpted by Alan Ball. How about this? 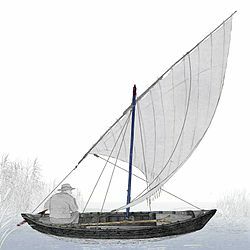 Check it out on the Flagship Models web site [url]http://www.flagshipmodels.com/zencart/index.php?main_page=product_info&cPath=7&products_id=115[/url]. 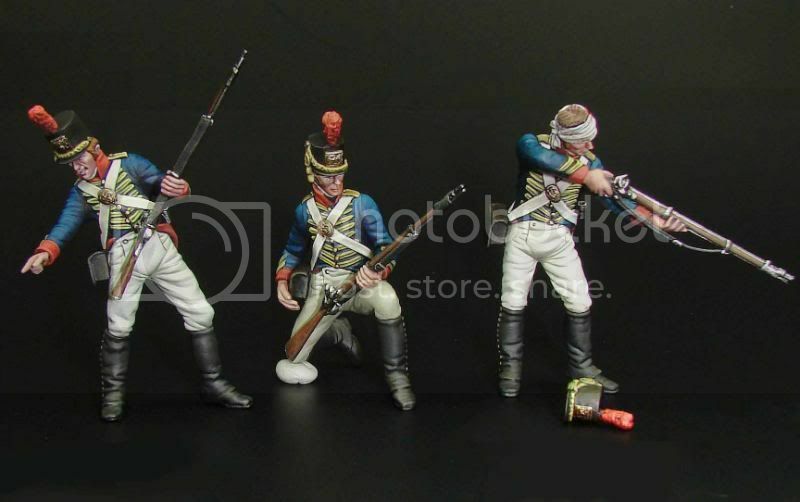 Lots of optional figures also available sculpted by Alan Ball. The mid-70's vintage Monogram Connie and United States were molded in the USA and appear to be original Monogram offerings and not someone else's kit - ie; not "baby" Imai kits. It is a nicely molded kit. I would guess it has since been absorbed into Revell of Germany and is offered as their Connie and United States. 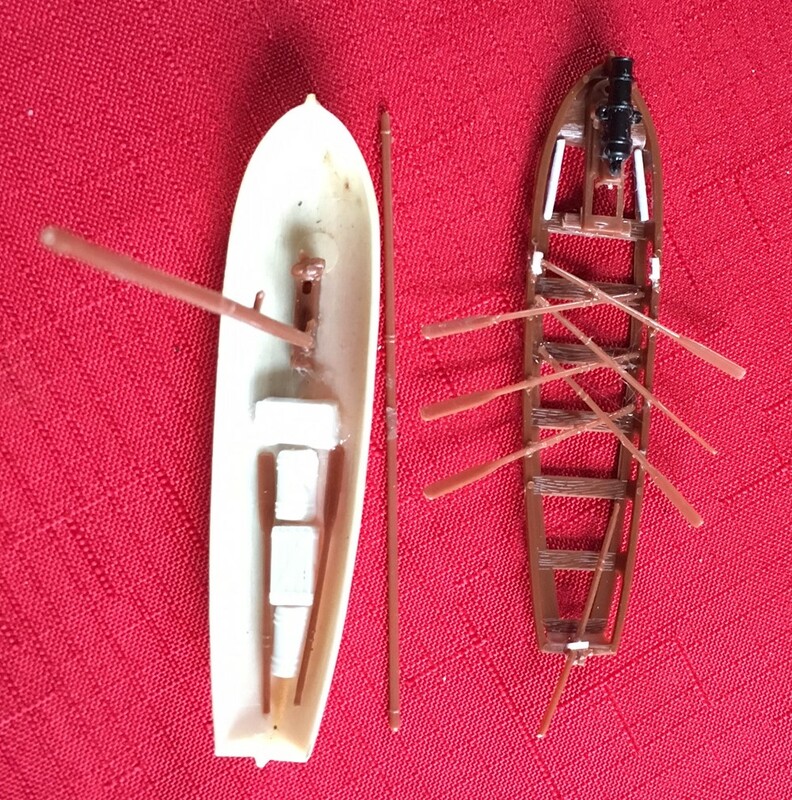 They have a 1-pc hull, molded ratlines with nice representations of (out of scale) rope, and vacuform sails. 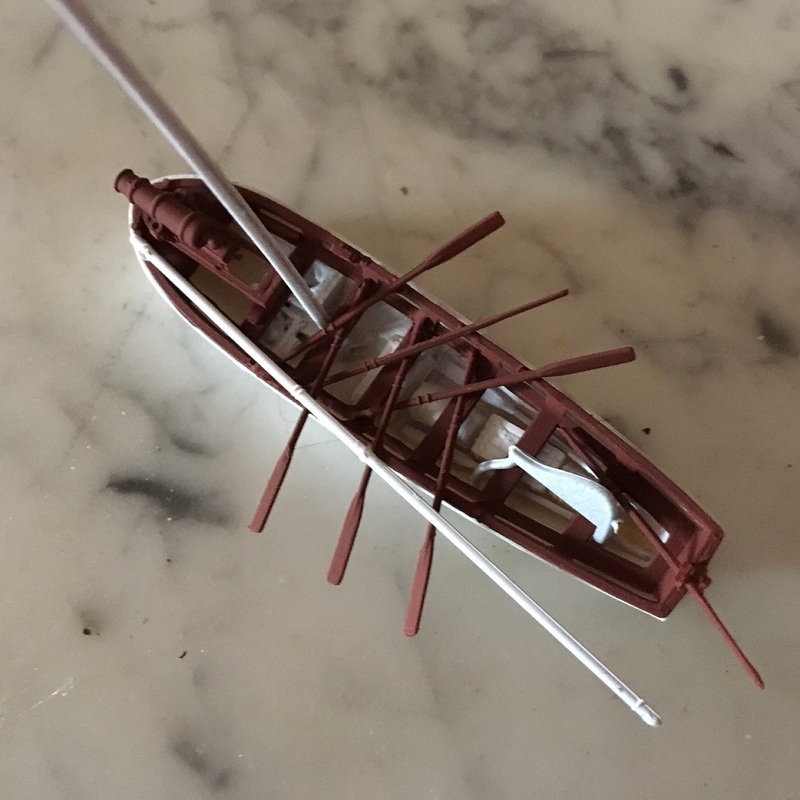 The kit has gun-deck pieces in a single molding for each side, and attach to the inside walls of the hull for the cannon barrels to stick thru. All gun doors are molded fully open and are the "split type". The hull is post-1812, but the bow has the simple design of the 1812 Connie - as opposed to the Andrew Jackson figure on the 1955-era Revell 1/196th kit. The main spar deck is similar to the 1955 Revell 1/196th kits in that the main hatch is molded closed. Some molded details of this deck are "soft", and some appear out of scale. And yes, this kit is indeed smaller than the Revell 1/196th kits; there is NO scale mentioned anywhere on my Monogram boxed Connie - but no way is it 1/150th. Still, I'd have to think its the best "small scale" Connie and United States out there. I see that this thread hasn't been active in a while. I hope somebody can help me out. 1) Is it really 1/150 scale? I ask this because if I choose to tart her up with aftermarket fittings, I'd like to know the scale. 2) Are there any plans for the USS United States available? I know that she is a sister of the Constitution, but there were some differences. 3) What would be the proper colors for the ship? Should I go with the instructions? 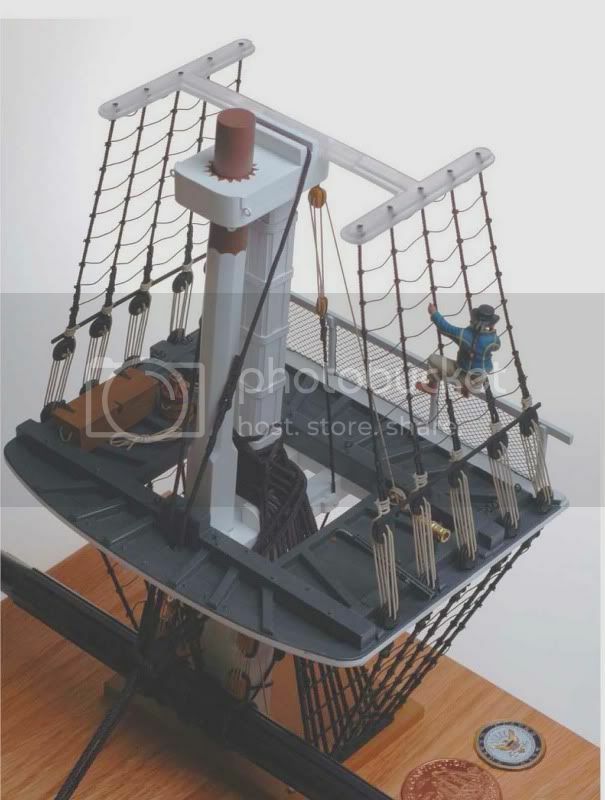 4) Related to question #1, where can I get 1/150 (or whatever the proper scale is) ship fittings? 5) Am I wasting my time on this kit? Your kit in "1/150" scale is - I believe but not 100% sure is - the 1-pce hull kit. 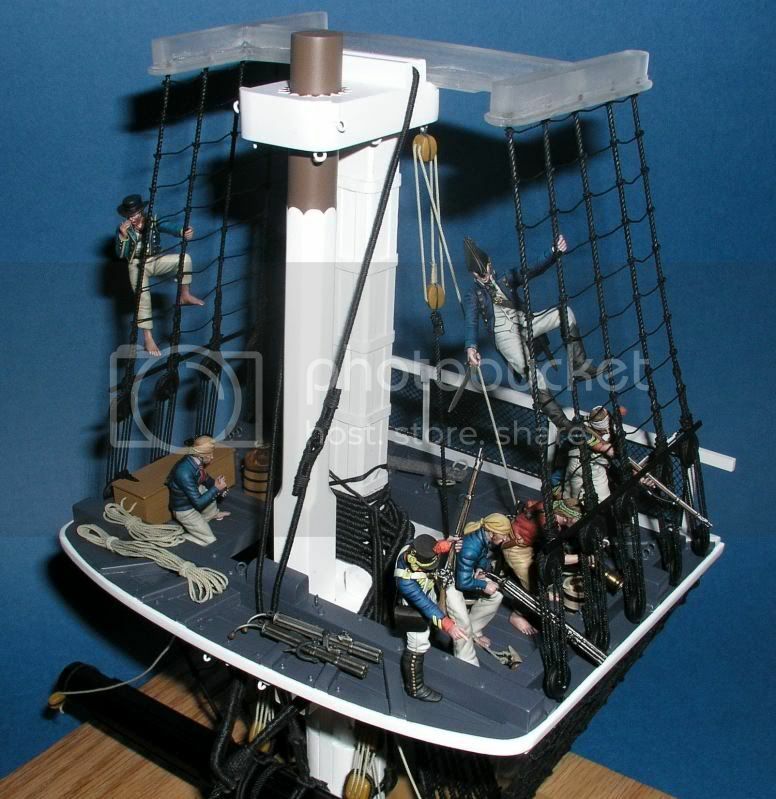 This would be smaller than the current 1/196th Revell kit of "Old ironsides" - that was first squirted in 1955. So - not 1/150th in size. I am still awaiting the arrival of my "not 1/150th" scale Connie kit in the mail. I personally do not view it as waste of time, but more as "practice" for building my 1/196th Connie; which itself is training for the big bout with my 1/96th Connie. [quote="fred_sirois"]I see that this thread hasn't been active in a while. I hope somebody can help me out.